Whoever came up with the idea of having breakfast for dinner is a genius. I know that weekends typically are the time when we think about cooking big breakfasts with all our favorite foods that we don’t have the time to cook during the week when it’s all we can do just to wake up on time and get out the door to work. Fancy, home cooked weekend breakfasts/brunches are great….but in my family, they don’t really happen all that often. See, the majority of my family really doesn’t get all that much sleep. When the weekend comes around, they’re not really thinking about what biscuits, waffles or casseroles they can get up early in the morning to cook- they’re thinking about being able to sleep in for the next day or so. In fact, the only time that usually happens is when we have family members from out of state visiting, which unfortunately isn’t too often. Generally, in a contest between laboring in the kitchen and catching some extra zzzs…the sleep usually reigns supreme. Me? I’m somewhat of a night owl and an early riser. Personally the idea of getting up early to cook a fancy breakfast is fun and exciting to me. But the idea of getting up to cook said fancy breakfast and no one even being awake (or willing to wake up) to eat it? I’ll pass. Luckily, there’s that nifty little invention called Breakfast for Dinner. With Breakfast for Dinner, I can feel free to make all the wonderful breakfast foods that would otherwise go to waste when made at the crack of dawn. There are certain breakfast themed foods that my family’s willing to eat at anytime of day- Breakfast Bakes are one of them. They’re versatile, delicious and pretty easy to put together. Not only that, but they taste good both hot and cold, so leftovers don’t even necessarily need to be reheated. 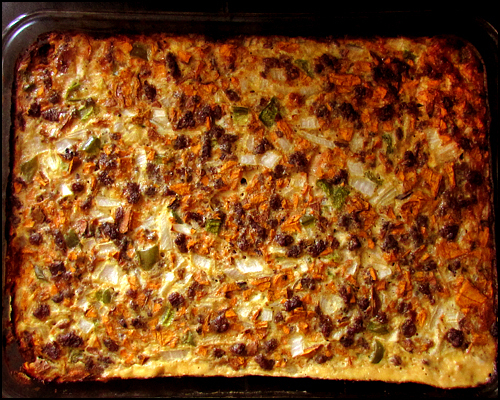 I’ve had/made breakfast bake several different ways; sometimes I make it more ‘breakfast-style’ and include some stale bread in the bottom for a kind of ‘crust’, but most times I go without the bread so that it more resembles a really fluffy, deep dish omelette. It tastes pretty good with sausage gravy over the top, or (my personal favorite way of eating eggs), sprinkled with Frank’s Red Hot or Tabasco sauce. 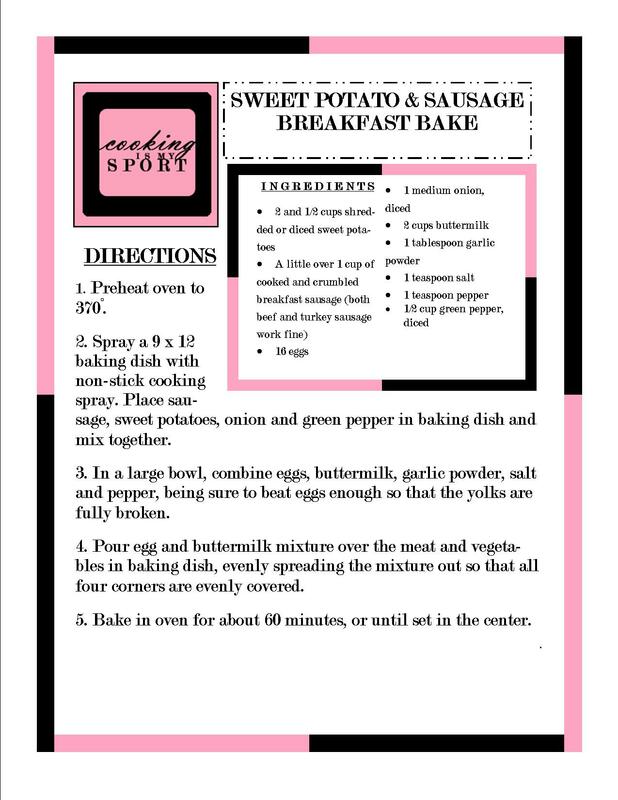 FEED(ME) BACK: What’s your favorite ‘Breakfast for Dinner” food? 1. Preheat oven to 370°. 2. Spray a 9 x 12 baking dish with non-stick cooking spray. 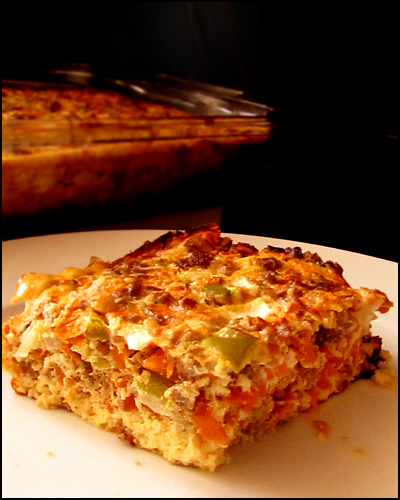 Place sausage, sweet potatoes, onion and green pepper in baking dish and mix together. 3. In a large bowl, combine eggs, buttermilk, garlic powder, salt and pepper, being sure to beat eggs enough so that the yolks are fully broken. 4. 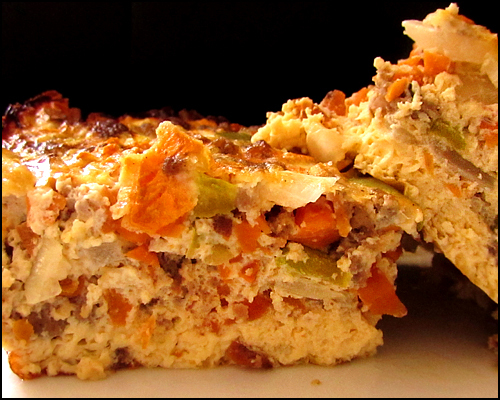 Pour egg and buttermilk mixture over the meat and vegetables in baking dish, evenly spreading the mixture out so that all four corners are evenly covered. 5. Bake in oven for about 60 minutes, or until set in the center.